Last night, Andrea Keleher stormed back to take the lead on the penultimate clue, allowing her to secure a victory over 5xer Kristin Sausville. Will she begin a streak of her own? With a Final category like this, this librarian has probably as good a shot as any, even though she’s in second place. Andrea really should be in third, but Gina botched the Penultimate Wager, putting up $2,000 when she had a $200 advantage over Brandon. When you have a situation like that, you know you have to get just one clue right to win the game. The question in front of you is: will it be this one, or the next one? If you like your chances on this clue, go for at least $12,801. If you don’t, no more than $199 to preserve the lead. If Andrea doubles her score, she’ll have 22,800. 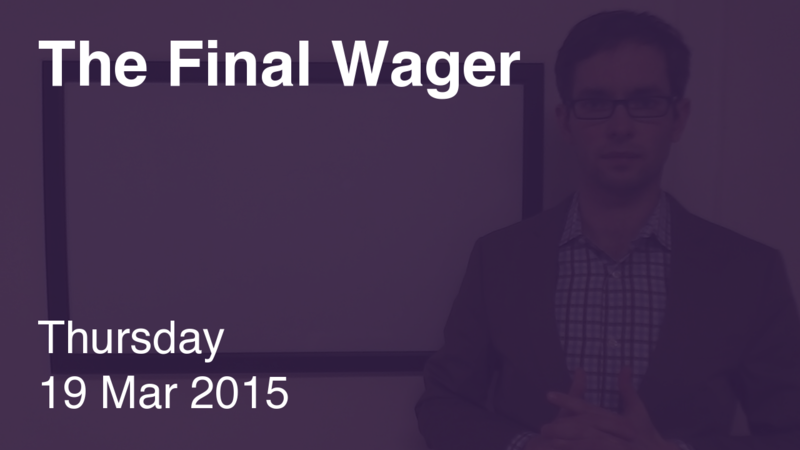 To cover this all-in wager, Brandon will need to wager 9,800. An incorrect response with that wager will leave Brandon with 3,200. To stay above his total, Andrea can wager up to 8,200. Gina can wager up to 8,000. A successful doubling will put Gina at 22,400. To cover this, Andrea should wager at least 11,000. In this case, though, she will lose on an incorrect response, so she might as well wager everything. If she’s wrong with that wager, she’ll be left with 3,600. So Gina should really cap hers at 7,600. Andrea can stay above Gina by wagering less than 200. Brandon, even more questionably, can guarantee a win on the triple-stumper with a wager of less than 1,600. Gina should wager at least 3,600 to cover both possibilities. Last night’s wager from Andrea should have tipped me off that maybe she wasn’t prepared. $10k is a stab in the dark. I’ve included a few thoughts on how to arrive at the correct response to this puzzle. My approach: Two V’s in the first name – what foreign language uses a lot of V’s? I actually watch that show. I’m not convinced that 0-199 and 12801 were the only good choices on the last daily double. A penultimate wager of 6301 (for the crush) would have been a reasonable third option. Missing there leaves her with 6899 and gives her a nice 2202-3699 wager range on FJ. She would still win with a solo-get, but the real prize is a chance to win on a triple-stumper if Andrea goes big. I think there’s enough equity there if she misses on the DD to make up for having a crush instead of a lock if she gets it. Moreso if Andrea isn’t a great wagerer. Good point, Aaron – I’ll think this through. Thanks! Unfortunately, I do not follow this thought. IMHO, if the contestant is trying to protect themselves from making an error on the PW to have a better chance in FJ, then why wouldn’t they just wager the 0-199 range? The reasoning is that if you can obtain a crush on the upside you’ll win a triple-stumper Final whereas you probably won’t by merely keeping the lead. I think any of the three options (keep the lead, go for the crush if right with some hope remaining if wrong, or ride it all on the DD and go for the lock) are perfectly viable. …….and, of course, go into FJ with the lead. I understand the point, but why take the chance of losing control of your own destiny if, as Keith always says, you showed up to win?